Lock in your week for the Summer of 2019 as we get booked every year. Newer Kitchen and Living Room! New TVs. New bedroom sets this year. The pictures have the old bedroom sets and will be updated. Perfect Location in LBI !!!! Beach Haven Crest. your family vacation in one of the best locations in LBI. ONLY 10 HOUSES TO THE BEACH and 1block to the bay. .
via the Atlantic City wind grid. We are putting money back into the local economy and upgrading every season. No high school, college, proms, or groups. PLEASE DO NOT INQUIRE ABOUT WEEKEND ONLY RATES as we do not have them. WE RENT OUT WEEKLY ONLY. It is in a great location and walking distance to ice cream, restaurants, and mini golf. Quiet street and you don't cross any busy roads to get to the beach. Our beach is great and has a lot of space. 1 Garage Bay is available for your car. Parking in the driveway for two more cars. Brand new living room this year. Will be a brand new Kitchen this winter. Brand new appliances. We had a great time during our stay. The house was very clean and maintained well. Kevin was a pleasure to work with. The location was perfect and within walking distance of everything. Our favorite restaurant was Pinky's Seafood which tasted great and was down the block. 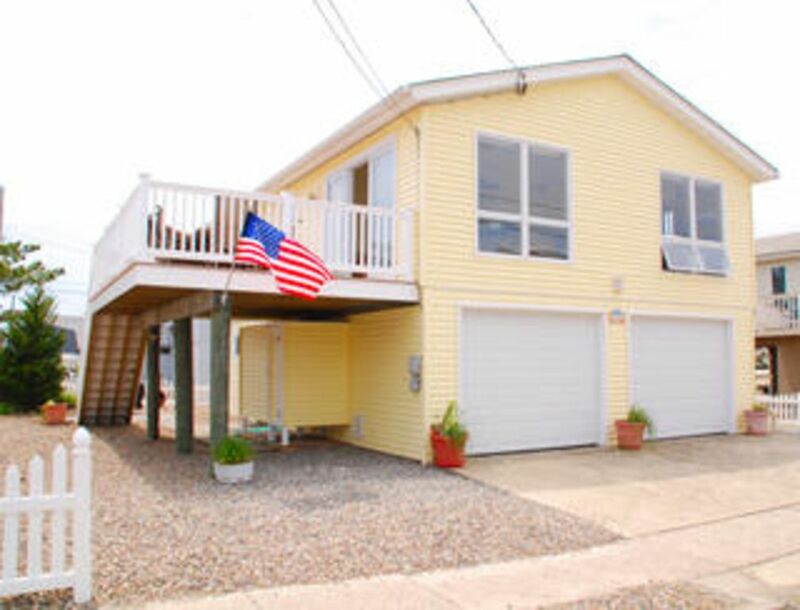 We would highly recommend anyone looking to stay in LBI to rent this house! We usually go some place different every summer, but everyone, including the teenage boys, loved our LBI vacation so much we decided to return to LBI this summer. We stayed at the same house. It is perfect because it's a single family house, great location, plenty of space for everyone, two full bathrooms, and storage for bikes and beach stuff. We especially loved all the upgrades they did. The owner Kevin is an absolute pleasure to work with. We love being close to the bike path, takeout from Pinky Shrimp is a favorite, we discovered the Chicken or the Egg this year (go before 8am for breakfast and just order take out for dinner - two hour wait any other time, but you'll understand why - so good). Our boys are already asking if we're going back next year! If you want a relaxing vacation, in a beautiful home away from home, this is THE place to go. There is plenty to do or plenty of nothing - whatever you choose. This house is prettier than the pictures - very comfortable, close to the beach (which allowed us to go back and forth and leave our things) and far enough away from the busy parts of LBI but close enough to pick up dinner, get ice cream at Barry's, or play mini golf. We traveled to LBI with two teenage boys. Our vacation was perfect! Kevin is a pleasure to work with. He responded to my emails within 1-2 days. The house was terrific. Spacious, clean, comfortable, and filled amenities. The indoor shower was only used once as we all fell in love with the outdoor shower. The family room is great, but it is not accessible from inside the house. Instead, you need a separate key to access it. This was not an issue for us, but it may be for families traveling with younger children and plan on using it as part of the upstairs living space. The deck is wonderful - spacious and comfortable. A table umbrella would have been a great though to help shade us from the morning and afternoon sun. The house is located in a quiet neighborhood, close to the beach. Our area of the beach actually felt like a little neighborhood since many of the same people came each day. We usually headed to the beach in the late morning, left our things to head back to the house for lunch, and spent the rest of the afternoon enjoying the surf and sounds and simply relaxing. Beware, the beach patrol showed up around 2 pm each day checking for beach tags!! We all brought our bikes and enjoyed riding on the bike path instead of the busy boulevard. The boys would ride over to the bay each evening to watch the sunset. Favorite restaurants on the island include Wally's (breakfast) and Tuckers. Our favorite was Pinky's - right around the corner from the house. We would bring our take-out meals back to the house and enjoy dinner on the deck or over to the bay and eat while watching the sunset. We would definitely recommend this wonderful beach house and hope to stay there again. I would note though, as a first time LBI-er, I did not realize how packed the local supermarket would be when we arrived on Saturday. Next time I will bring a cooler with some basic necessities to get us through till Monday!! relaxing or gambling in AC. You can walk to it all.